or to be correct the float valve which controls the flow of water into a lavatory cistern or cold water tank. In the early 1950’s BRS was receiving frequent complaints about failure of ball valves. One local council in Hertfordshire wrote that they had to replace nearly 'a hundred valves every week on their estates’; another in Essex want to know how to stop the floats dropping off; a plumber in Hayes, Middlesex, wrote that he is losing customers because the new valves he puts in do not last six months; and a man in Ventnor wonders if it is sabotage by his plumber that his valve begins to leak a few months after fitting. There is also the sad story of an elderly lady in Golders Green who spent the whole night pulling the chain in the lavatory to stop the flood from a cistern where the ball valve had failed. The ball valve or to be correct the float valve regulates the flow of water into the lavatory cistern or tank in the loft and closes when the water reaches a predetermined level. Failure was usually due to sticking of the piston or cuts or channels that have been cut by the water flow into the seating and the rubber washer can no longer form a watertight seal. For a long time these cuts were thought to be a result of chemical action by the water. Experimental testing at BRS showed that they were as a result of microscopic hammering or blasting called ‘cavitation’. Water under mains pressure flows past sharp edges and corners with the consequence of a rapid drop in pressure. Water vapour bubbles form which rapidly collapse increasing the water flow locally to hit the metal with considerable force. Small grains of metal are detached and repeated action forms the cuts and results in ultimate failure. The phenomena could often be heard as a sizzling noise. Having discovered the cause of the trouble, BRS then turned to ways of eliminating the problem. One way would be to reduce the pressure of the water main but the installation of suitable valves would be expensive. Throttling the stop valve could have been of benefit but at the price of unacceptable flow from taps. The redesign produced by BRS reduced cavitation by rounding off all sharp corners and limiting the gap between the seating and the sealing washer. The problem of sticking pistons was overcome by introducing a thick rubber disc with all the moving parts sited the dry side of the disc. A local brassfounder manufactured 500 valves which were sent to various Water Authorities for trials. Comments were generally very favourable both of the valves performance in controlling the water level also that it was much quieter than other patterns of valves. These reactions encouraged the development of a Mark III valve which improved the flow rate and introduced measures to prevent a plumber over tightening the body and deforming the rubber washer. The critical element is the nozzle and trials were undertaken with parts manufactured from stainless steel and from nylon. Reports were received of nylon nozzles being damaged when the water in the ball valve froze solid. Tests at BRS could not cause damage to the nozzles; the copper pipe feeding the valve split relieving the pressure. Original ball valves were manufactured to a British Standard BS 1212 and the Garston ball valve is now retitled the diaphragm ball valve and is manufactured to British Standard BS 1212-2 for brass valves and BS1212-3 for plastics. The main difference from the original design is that requirements to prevent backsiphonage mean that the outlet is from the top of the valve with a U shaped pipe diverting the water into the cistern. Certainly in number of valves manufactured and in the benefits gained, the Garston Ball Valve has possibly the greatest impact of any innovation produced by the Building Research Establishment. A Sobolev, Failures of Ball-Valves and their Remedies, Journal of the Institution of Water Engineers, Vol. 9, No. 2, March 1955, pp 208-222. A Sobolev, Design of an Experimental Ball-Valve, Journal of the Institution of Water Engineers, Vol. 10, No. 7, November 1956, pp 552-557. A Sobolev, BRS Ball-Valve Trials, Journal of the Institution of Water Engineers, Vol. 11, No. 6, October 1957, pp 497-503. 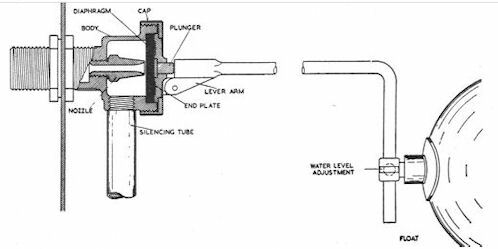 A Sobolev, The Effect of Freezing on Ball-Valve Seatings made of Nylon, Journal of the Institution of Water Engineers, 1958, 12, (7) November, pp 515-518.